Monday to Sunday November 18th to 24th, Almost Thanksgiving With A Christmas Tree? Thankfully, this week is starting off very slow! Since we make the girls special lunches every day of the week, Ingram decided we needed to make Daddy a special lunch and take it to his office; he even decorated a brown paper sack and then we loaded it full of enough goodies for more than one meal! Of course, the parking lot is a lot more fun when you're playing hide and seek instead of just sitting in the car. Luckily, there weren't many other cars coming and going and it's probably good that Daddy only lost Ingram once! After trying to fight a lot of boogers for a while, Ingram finally went in to see Dr. Ellis. It turns out that Ingram has grown too and is now in the 75th percentile for his weight; I guess we don't have to worry about him not catching up to all the other 5 years old anymore! It turns out that he has yet another sinus infection and started on a stronger antibiotic than he did last time to help knock it out faster. The thing about Memphis is that the weather is always changing back and forth so that never helps his sinuses. And today, he actually stripped off his shirt in the exam room because he was so hot from the super bright sun shining in the windows. You got to love boys! He's Not As Pitiful As He Looks! Tuesday was pretty interesting because we had to pull the kids out of school for a little bit to get Passports at the post office and they don't have after school hours. The whole experience was comical, but when it finally came to taking their pictures, we couldn't keep from laughing! Just imagine trying to get our one of our kids to sit still while the other four of us were laughing and staring at them. Our postal lady Pam was great and took good care of our babies; and yes, she called them babies and me honey the whole time. It was surprisingly lots of fun! Wednesday Ingram was excited to be back at school since he didn't go on Tuesday and even better, his buddy Nolan brought donuts to school for his birthday snack! Thursday was an even more fun day at school because it was the Thanksgiving Feast at preschool. Ingram was the cutest little Indian in his vest and hat and had a blast while he was at the Feast; however, afterwards, he started to cry because I wasn't there to pick him up early from school! Hugs from his teachers and a quick trip to Gracie Bleu after school at regular pick up time seemed to make it all okay. Friday was a rainy day that turned out to be a fantastic pajama day! It had rained overnight and the temperature had also dropped and we cancelled our plans and stayed inside all day long! Ingram insisted that we watch The Avengers (again) in the big chair while we ate M&M's and goldfish. Beau also figured out we had food and decided to hop up in the chair with us too. After the movie, it was time to go upstairs and play the Wii and Ingram beat me in every race of Mario Cart that we played. Once the girls were home, we decided to go see Beauty and The Beast Jr. that the school was putting on and it was so much fun. We ran into several friends at the play and Ingram found one of his buddies Jacob! Ingram sat (for the most part) through the whole play and loved running around afterwards getting autographs from the cast members. These Boys Cannot Be Still Long Enough For A Picture! Meeting The Stars Of Beauty And The Beast Jr. Ally Was A Silly Girl...Literally! Saturday was a big day because our new Team Ingram shirts were delivered and we had fun taking pictures with the new shirts and re-doing the CONQUER Shop website. We spent the rest of the day getting the shirts sorted, folded, and stacked; please make sure you check out the CONQUER Shop either through this link at www.kidsconqueringcancer.com or through the blog and see what's new. As always, proceeds from all sales are sent to St. Jude Children's Research Hospital to help them find cures and save lives. Ingram also had another birthday party at SEGA and this time it was Lola's birthday! This was the third weekend in a row with a birthday party at SEGA from Ingram's class and it never seems to get old; all the kids love playing with each other and of course all the parent's chat the whole time too. Madison and Lindsey tagged along and were so good helping out instead of participating in the party. Now To Just Get Them Set Up And Ready To Sell! Out Of All The Colors On The Parachute To Pick From...It's ALWAYS Green! Yep, Ingram's Making An "L" For Lola, But With The Wrong Hand! Maybe He Was Just Making It Like That For The Camera?? Sunday morning was a big uh oh! Craig woke up extra early and headed to the office to get some work stuff done before church and left while we were still sleeping. Apparently there were two sleepyheads in the house that stayed up way to late watching "Catching Fire" at the theatre and then slept until almost 10am!!! Lindsey and Ingram didn't even wake us up either; they were coloring, eating fruit snacks, and watching TV; Beau didn't even bark or anything either! Once we awake enough to realize what time it was, it was too late to make it to church on time, so we started cleaning up the house and decorating for Christmas. I know it's a little early, but it's 30 degrees outside; we even turned on the Christmas music on the radio and normally we have a strict "after Thanksgiving rule for all things Christmas!" The rest of the day we spent working around the house and then everyone headed off for an early bedtime. We love spending cold rainy days inside where it's nice, dry, and warm! Take The Blame For Sleeping In On A Sunday Morning! The Kids Tree They Did By Themselves As A Surprise! In breaking news...the "Thanks and Giving" campaign kicks off Monday November 25th at retailers all over the country! Everywhere you see the neon green St. Jude signs, make sure you go in and shop; each store has different ways to donate to St. Jude right at their checkout! Ingram was one of the "poster kids" for the campaign last year and we found his picture in magazines and billboards all over the country! NBC's The Today Show will be spotlighting "10 Years of Thanks and Giving" every day of Thanksgiving week so make sure you stay tuned to see amazing stories of many of our SJ friends! As always, you can make a donation to SJ through our Team Ingram website at www.heroes.stjude.org/teamingram or through purchasing a shirt from the CONQUER Shop at www.kidsconqueringcancer.com Either way, your money goes to "Finding Cures and Saving Lives!" Monday to Sunday November 11th to 17th, What Are They Going To Do Next?? Our week started out with a bang (literally) since the kids were out of school for Veteran's Day! Daddy and the girls went out to an early breakfast while Ingram and I slept in late. Once they got home from breakfast, the kids continued the Nerf war that was started the night before with the Whelan's. At one point all three of the kids were attacking each other, but then the little two teamed up like they usually do and tried to take on Madison. They tried hard, but Madison manages to beat Ingram and Lindsey every time! After they cleaned up their mess, we enjoyed an late lunch on the porch at Chick Fil A. The kids were complaining because the sun was so bright, but I'll remind them of that when it's all gloomy and cold outside over the next few months. It's Not As Bad As It Looks! Like I Have Said Before...Totally Normal Around Here! Apparently Team Ingram Is Locked And Loaded To Take On Madison! They Would Have Really Appreciated The Sunny Lunch! Tuesday the kids headed back to school and the weather changed dramatically! We went from wearing shorts to bundling up as much as we could for the Madison's soccer practice and Lindsey's soccer game that night. It was actually so cold that Ingram and I only stayed at Lindsey's game for about 10 minutes before we had to leave; poor Daddy and Lindsey had frozen fingers and toes by the time they got home at night! Not even "hot hands" and "toasti toes" could help when it they were outside for a couple hours in the 30 degree temperatures!! Ingram and I got to tell our story Wednesday afternoon on the Williams-Sonoma "Thanks and Giving" conference call. We love telling our story in person, but also have been given opportunities to reach hundreds more people over the phone at once to tell them how great St. Jude is and about the amazing work they do there. Ingram even got on the line at the end and told everyone about his day at school and thanked them for raising money for St. Jude. I love listening in on his conversations that he has when I'm not on the line. Thursday when I went to pick up Ingram from school, I saw one of those "incident" forms with Ingram's name right on top; I instantly knew what it was because we have filled out more than our fair share of them when our girls were in preschool. I'm not sure what it is, but I hope other parent's fill them out regularly or I might start to think that my kids have a little extra energy or something! Ingram was telling me what happened and it turns out that he and a couple boys were racing and somehow the crashed and boom...Ingram has a big boo boo on his nose. Oh well, he had fun doing it and really had fun telling us all about it! Injury is so the normal thing with our kids! Yeah, I'm Pretty Sure That's Going To Leave A Mark! Madison and Lindsey continue to blow us away with their drive to raise money to fight Childhood Cancer for Ingram and all the other boys and girls in the world diagnosed with cancer! Friday, the Association of Fundraising Professionals awarded them... the "Spirit of Philanthropy" Award during their luncheon at the University of Memphis. Ingram, Mr. Joe Birch from Action 5 News, Mr. Shadyac and the crew from ALSAC, Mimi and Pops, and the entire room gave the girls a standing ovation as they received their award! After Madison thanked everyone and told them a little about Ingram and St. Jude, Lindsey took the podium and said "You can drop off your checks to St. Jude at our table!" They're ALWAYS in fundrasing mode!!! Our former neighbor, Shelia Ferguson, nominated the girls after she heard about all their work last year to raise money for St. Jude Children's Research Hospital. She even came back in town with her family from Colorado to be able to see the girls get their award. And Their Fundraising For St. Jude Before They Come Up On Stage. Madison Thanking Everyone And Telling More About Ingram And St. Jude! Their Checks At Her Table For St. Jude! Ingram And Mr. Shadyac Chatting At Lunch! The Girls About Their Videos. He Came In From California To Do Some Filming At The Hospital! Our Favorite Memphis News Anchor! 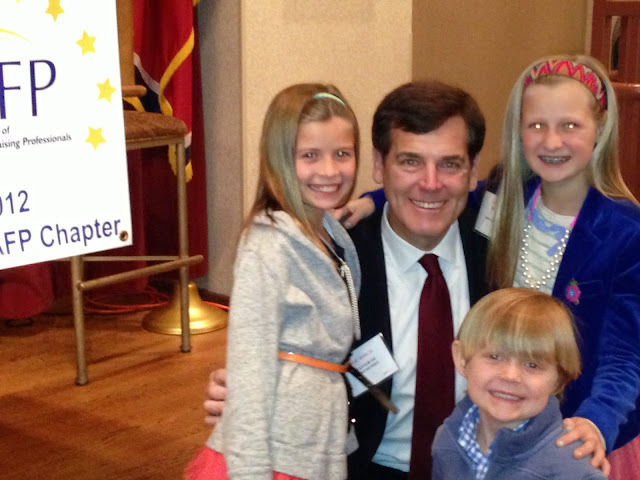 Mr. Joe Birch From Action News 5 With The Kids! After the luncheon, we headed to the ALSAC office at St. Jude to drop off some more checks that we had gotten for the Marathon Weekend and we couldn't leave without a trip into the cafeteria for some ice cream! We finished off the night with our favorite Family Movie Night and watched Turbo. When it was over (at 8:30pm), I tried to convince everyone that it was bedtime but it didn't go over like I had hoped! 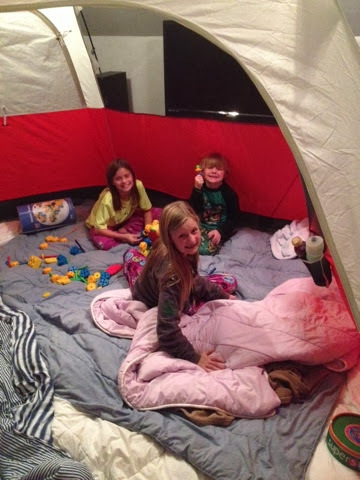 Daddy, I thought was coming to my rescue to get all the kids in bed early, instead said "Who wants to sleep in the tent?" and the kids went crazy!! They spent the next half our or so getting the tent up and then another thirty minutes or so trying to calm down enough to go to sleep. While we were all laying down in the tent, it was sweet to hear the kids talk about their day and how much fun they're having just goofing off with each other. It makes me even more thankful that Ingram is still with us today and makes me think about our Cancer families that lost their children even more because I know they would love to have more time with their family all together. Playing Together And Stalling Bedtime! 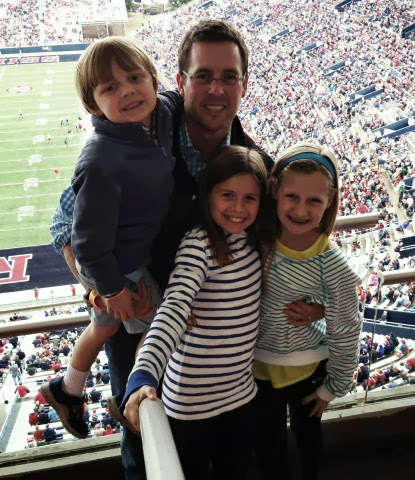 Saturday morning Daddy and the kids drove down to Oxford for the Ole Miss football game. Ingram has never been to a college football game and got himself dressed to play football instead of watching it. 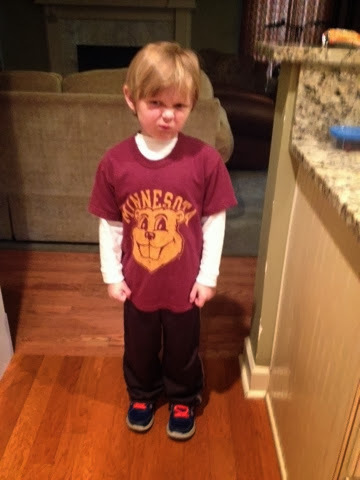 Poor little guy was a little upset when I told him he wasn't playing today; maybe it has something to do with the fact that now he says he wants to be a football player! Here is what Madison had to say about the game... "It was really fun because we got to sit in a box with our friends, and Michael Oher's mom and sister which was really cool! The rebels won, which was awesome and we got new shirts- and mine is chevron which is awesome. And we got to go to Holly Sweet Tooth and get candy." Yep, she's soooo a Middle School kid! Here's what Lindsey had to say about the game..."The game was fun, we got to sit in a box. After the game we went to the Square and went to the candy store. We saw some friends, the Erhart's, at the Square. I had a great time. (funny note from Daddy- as we were leaving once the game was over, Lindsey asked me which team Ole Miss was). I guess we should make sure she stays on the soccer fields so she always knows which team is which! We never know what Ingram's going to say, but here is what Ingram had to say about the game..."It was good and we went to the candy store and I love candy. And they won the game. And I like my jersey since it's a number 5. And I love mommy. And that's all." Even when Ingram's not with me, he still manages to melt my heart. No wonder he gets away with everything! He Just Found Out He's Going To Watch Football...Not To Play Football! Loving His First Football Game With The Girls And Daddy!! And Yes, He's Wearing His Florida Shoes! After church Sunday, Ingram got to go to another birthday party at SEGA and this time it was his favorite buddy Nolan! Last year he missed Nolan's party because we were in New York City for St. Jude with the "Thanks and Giving" campaign and Nolan still remembers Ingram missing his party. They had a blast at his party and then when it was time to go, I found them hiding under the table so they wouldn't have to leave. Since it was 77 degrees when we got home, we decided to take advantage of this crazy weather and play outside because pretty soon it's going to be freezing cold again. Ingram hit baseballs, took Beau on a walk around the big block, and even stopped by one of his teachers house; she wasn't home, but now we know where she lives and I imagine he'll peep in her front door again on another walk! Ingram's Wearing His Ole Miss Jersey Because He's Five! Ingram And Nolan Trying Not To Be Found Under The Table! Too Bad They're Too Loud!! It's Baseball Weather In November! Why Is It Ingram Always Gets To "Ride" On Our Walks? We finished off the night with an early spaghetti dinner and movie night with the kids and it was once again Ingram's pick...Kung Fu Panda 2! We watched this movie and Cars 2 about a thousand times each during all of our hospital inpatient stays. I'm not sure if he remembers that or not, but he sure does love watching it. I absolutely LOVE movie nights because Ingram always manages to snuggle up with me and tell me he loves me a thousand times. I wish we could have movie night every night! Monday to Sunday November 4th to 10th, From Sickness To S'mores! I'm not sure why the days seem to be flying by now, but I think it just might have something to do with the time change. I love that it's light by 6:30am when Madison is heading off to school, but I really don't like it when we all start yawning around 6:30pm when it's already dark. Of course, maybe we might start slowing down around the Dismuke house and take advantage of the yawns and head off to bed early. I know, it will most likely never happen, but I can dream! Monday was a little different than normal because Madison was home with a fever and had to stay in her bedroom while Ingram ran around the house causing all sorts of noise! Ingram had a lot of fun watching Madison get examined when we took her to the Clinic; normally we wouldn't have gone in, but all five of us were going to SJ on Tuesday for an interview so we had to know if she was contagious or not. Ingram was also getting a kick out of Madison wearing a mask to contain her germs until we knew exactly what germs we were dealing with. Wouldn't you know it that after having fever all Sunday afternoon, night, Monday morning, and afternoon that it was gone when they checked it at the clinic? It turned out that her sinus congestion was producing her low grade fever and so she was allowed to go to SJ with us! Was Watching The Exam Being Given! It's Nice To Change Things Up Every Now And Then! After letting the schools know the kids would be out, we headed down to SJ first thing Tuesday morning for our interview with Anna Kooiman from Fox and Friends!! We were all so excited because we had been looking forward to it for over a month and it was finally here. Lindsey started looking a little puny on the drive in and she also didn't want any breakfast; looking back now, that should have been a major clue that something was going on with her. We had just walked in the doors of the Chili's Care Center and then Lindsey high-tailed it to the restroom where she proceeded to have "an unfriendly conversation with the commode." I'm not sure what upset her the most...getting sick or not being able to be in the interview. Poor girl had to wear a mask from the lab and then had to walk right back out of the hospital until we figured out what we were going to do because our interview was set for the 2nd floor where all the inpatient families were. Lucky for us, the interview had been moved to the 4th floor where no patients are and we set up Lindsey in the furthest end of the floor in a recliner with both a trash can and a restroom near her for when she needed it. Yep, By Lindsey's Face, I Should Have Known! The four of us had a great time with Anna and our Alsac representatives and were able to tell our story and what St. Jude means to us. Anna also asked Madison and Ingram questions and we held our breathe each time Ingram answered because we never know what he's going to say! They both did a great job with their interviews and with the pictures afterwards. Lindsey was watching shows on the iPad and playing games to pass her time, but she definitely wanted to be at home in the bed snuggled up in a blanket for the hour and actually perked up after the second hour. When we wrapped up, she wanted some lemonade so we headed to the Cafe with her still in her mask and with a "Barf Bag" in hand; instead of getting sick again at the smell of food, she wanted to eat...pepperoni pizza! The lemonade made her feel better and surprisingly enough she ate her whole pizza and some fries and was actually feeling normal by the time we got to a corner table. After lunch, we went outside to take Ingram to take a few more pictures with Anna and to video an introduction that Fox and Friends could use to promote the actual segment. They were goofing off during the pictures and Ingram even somehow talked Anna into giving him a piggy back ride! Pepperoni Pizza Three Hours After Being Sick...YUCK!! The Crew With Danny Thomas! Ingram And "Fox and Friends" Anchor Anna Kooiman! We Cannot Wait For This Segment To Air! Finally Dropping Off All The Art Supplies From Ingram's Birthday At Mrs. Penny's Desk! All three of the kids went back to school Wednesday and even played in their soccer games on Tuesday night. It was the first time that they both had something come up as quickly as it went away; they felt great just a few hours after they got sick. We were very excited to have an slower night with only one soccer game happening instead of both of the girls having soccer. It was also raining so Daddy took Lindsey to her game and the rest of us stayed home and stayed dry! Thursday was another extra fun day because Ingram had his Preschool Fall Program! He had been practicing with his class at school for a long time and even trying to sing his songs for us at home so we were all ready to see him sing and dance on stage. We met Daddy for dinner at Moe's (Ingram's choice since it was his night) and then headed to church for the show. And a show it was!! It's funny how you notice strategic placement or rather strategic separation of the boys in the class to make sure that no Kung Foo moves break out during the Program which we heard started happening in the hallway with Ingram and his buddy Nolan! It was definitely a fun Program and the kids had the audience laughing at several times with their funny songs and creative dance moves. Afterwards we had to make a quick trip to TCBY to celebrate the big show just like we did with the girls when they were in Preschool. I can't believe how quickly time has flown by for all three of them! I hope it's a good thing that just about all of our memories include trips to the ice cream store...no matter what time it is! If You Could Only Hear The Kids Doing This Song!! Hilarious Doesn't Even Get Close To A Good Explanation! Do You Think Ingram's Grown A Little Since He Got The Shirt? Post Program Ice Cream Celebration When He Took A "Bath" In The TCBY Bathroom! What Will He Think Of Next?? Friday was a quiet morning at home until we headed out to run a few errands including taking Daddy lunch at work. Ingram LOVES to go to Daddy's office and take him lunch; he really loves it when he gets to go inside because he runs by the front desk to get a piece or two or three of candy! Once we were back home, we started getting ready for Family Night with the kids. We had been planning it all week since it was the first time in a month that everyone was going to be home on a Friday night! The kids helped with dinner and then we ate in the den and started watching Ingram's pick for our movie...The Avengers. My favorite part of the night was when Ingram climbed on the couch with me and told me that he wasn't going to get married ever and that he wanted to live with me forever. Of course, I was melting!! Then the next sentence out of his mouth was "We can marry off the girls so I can have more time on the knee board without having to share the Lake." I guess it's good to know he's thinking long term right? But in the short term, the plan for the evening was to make S'mores while we watched the movie, but Daddy and Madison conked out after the first 15 minutes. We knew they were exhausted, so we stopped the movie, put them in bed, and saved the movie and S'mores for later. You guessed it, we had S'mores for breakfast and watched The Avengers all before Madison and Daddy left for soccer at 9am! I have to admit, it was quite possibly the easiest breakfast because everything was ready from the night before. We didn't even attempt to add anything healthy to it, because sometimes, you just need S'mores for breakfast! Our day continued to be great with two fun parties in the afternoon and evening. The first was a gymnastics birthday party for Ingram with all his buddies from school. They ran around SEGA gym for an hour playing, bouncing, jumping, and swinging like monkeys before heading in for cake. If you have never been in a small room with about 15 4-5 year old boys, you may want to consider bringing earplugs!! Ingram Flying High Just Like Spiderman! Our second party of the night was for the whole family at Habitat for Hope which felt like being out in the country with a hayride, a horse ride, and a barn with a concrete floor for riding scooters, skates, and anything else with wheels. Ingram finally talked us into letting him try to roller skate, but we didn't let go of him at all! Poor little guy doesn't have good balancing skills like other kids his age or even like our girls when they were his age, but I'm sure all that will come with time and it doesn't seem to bother him. At the Fall Fest, we ran into old friends and met several new friends; we even met another SJ patient that had a benign brain tumor when she was three and we were able to share stories and the kids showed each other their surgery scars. The crazy thing about this family was that we have several friends in common and our kids have even gone to the same schools. We still get amazed at how God puts people in our lives that can be an encouragement through their SJ story and we pray that we might be an encouragement to others that come after us as well. Thankfully, Ingram Never Hit The Ground! I Wish I Could Say The Same For These Two! Lindsey And Sarah Are Always Going Full Speed Ahead! Boing Boing Boing Boing Boing! Yes, They're Jumping On A Giant Inflatable Twister Board!! Finishing The Night Off Staying Warm By The Fire!! Going to church Sunday morning was wonderful as always, but today was even more special. Lindsey got baptized a few months ago and today was the day that they showed the video of her baptism as well as her talking about when she accepted Christ as her Savior! Lindsey was so cute in her interview and even more cute when she was giggling watching herself on the screen. Once we made it home around 1:30pm from lunch and walking around Sports Authority (it was in the same parking lot of the restaurant), Daddy and the kids played tennis in the street before Daddy took the girls running at Shelby Farms. Ingram stayed home and we took Beau on a walk then got ready for a second round of S'mores with the Whelan family. With the kids out of school Monday for Veteran's day, we figured we could all use a little extra chocolate! The kids not only played soccer outside in the dark, but they also spent hours chasing each other around the house with every single Nerf gun in Ingram's closet. I think at one point, there were probably around 100 bullets scattered about...guess I know what our kids are doing when they wake up in the morning! We are still in fundraising mode for the St. Jude Memphis Marathon Weekend at the Dismuke house and wanted to pass along a few opportunities to donate money to St. Jude! The first is through a college friend who is also a member of Team Ingram and her kids go to school with our kids. 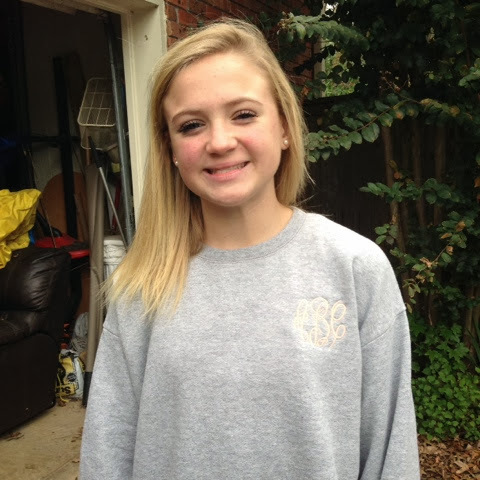 Brandy Blank is making monogrammed sweatshirts to help raise money as a St. Jude Hero! For the next week only, ALL proceeds go to St. Jude to help fight childhood cancer and they come in both kids and adult sizes. She's selling them for $25 and can be contacted at blankb@bellsouth.net to place your order. The second opportunity comes from a high school friend who works for Brooks Running Company! If you LOVE Brook shoes and clothing, you are going to LOVE this next offer. Thanks to my friend Rebecca Seago-Coyle, we have a $100 card for Brooks shoes or apparel to give away! The first person to donate at least $200 to my Hero page will not only help in "finding cures and saving lives" at SJ, but will also win $100 to be used on a purchase of Brooks gear. The link to make the donation is www.heroes.stjude.org/ashleydismuke so go ahead and make a difference today! If you're not interested in a monogrammed sweatshirt or trying to win the Brooks Gift Certificate, a regular donation can be made to St. Jude through Team Ingram. The link to make a donation of any amount can be made through www.heroes.stjude.org/teamingram, www.heroes.stjude.org/madisondismuke, or www.heroes.stjude.org/lindseydismuke and they will all be very much appreciated. It's Already Sweatshirt Weather Here In Tennessee!! Monday to Sunday October 28th to November 3rd, Fun Times! This week has been another busy one for everyone and espeically Ingram. He has had something fun to do every day of the week! Hopefully, we will be able to give highlights from the week that can capture all of Ingram's little shenanigans that he pulls! Apparently seven days is as long as Ingram could go without a bath! We were supposed to wait for 10 days, but boys are just way too stinky! Beau even got a bath after Ingram and now they both smell much better! Since it is Halloween time, Ingram decided that he wanted to "BOO" our neighbors because it's so much fun to do. It was a school night for all, so we kept it quick and opted to not roll any houses. Ever since his first "toilet paper" adventure, he's been begging every day to do it again and hears "No" each time he asks. He loved "Booing" two of our neighbors and didn't even get caught. Unfortunately, I have a feeling they're about to know it was us! Look who's Steri-Strips came off during the night! Ingram was pretty excited now that Mommy doesn't have any reason to attempt to keep him from climbing all over things. Guessing those huge red climbing balls outisde of Target may have had something to do with the Steri-Strips coming off. Or maybe since it had been 9 days, it was time for them to fall off anyway; of course, I'm sure Monday night's bath helped a little too! Loving on Ingram during the first ever Chapel service at Germantown Baptist Church Weekday Preschool this week! We were all cozy in our spot when he looked up and said "Mommy, can I go sit with my friends?" I thought I had a few more years until he choose his friends over me. I guess he's learning a little early thanks to those cute big sisters of his! Ingram not only loved his first Chapel, but he also got a brand new Jesus Storybook Bible! Lindsey received one several years ago for her birthday, but now Ingram has his very own and we have been reading it ever since he got it. He even asked Madison several times while she was doing her homework that she gave in and read him one of the stories. I think she loved it just as much as he did! I never knew that I needed this much help, but Captain America came in to rescue ordinary cupcakes and turn them into fabulous Halloween cupcakes for all of our neighbors to enjoy! THIS is the way to save energy and be able to run with the big boys when it's finally time to trick or treat! This is the young side of the trick or treaters that we ran around with Thursday night! A train conductor, Superman, Captain America were the youngest of our crew followed by an ice cream sandwich, a hot dog, a blueberry, a Lobos soccer player, and Samantha from the American Girl dolls. You never know who will show up when you go to a party at the Wests' house! And then a girl from the Hunger Games Captial showed up with some McDonald's French Fries and a Coke. Seriously, you never know what will show up! Our crew right before they headed out to ask everyone in our neighborhood for candy. Madison was a McDonald's French Fry with her costume (including wood, posterboard, and pool noodles) made by Daddy. Lindsey was an awesome Lobos soccer player and sported the Blue Georgetown Hoya hair. Ingram was Captain America and was rescuing candy from all our our neighbors! Speaking of candy, Ingram had a very unique perspective on his candy this year and asked several people to let him pick out his own piece. He wanted to make sure that he liked it and asked for M & M's at just about every house. He started out for about the first 10 mintues running with the older boys and he was even keeping up! He was following Damiel (his name is really Daniel but for some reason Ingram says "M" instead of "N"), Grey, and Jake and they were watching out for him. Ingram even said that his favorite part of Halloween was "running with the big boys!" Once he got to tired from running so fast (and Mommy was tired too), he walked the whole big block with Cooper, a 3 year old Superman that just moved into the neighborhood. These two went about a mile and ran off and on making their way all the way around the big block before heading back home! Yep, trick or treating is exhausting and Daddy went to tuck Ingram in bed and managed falling asleep himself! I tried several times to wake him up, but I finally covered him up with Thomas the Train and shut the door. On Friday's Ingram get to pick out whatever we do and he calls the it "Super Ingy Day!" This Friday, he decided that he wanted to take Mommy on a lunch date to Wendy's and then take Lindsey lunch at school too. So after we ate, we dropped off Peanut's lunch and headed back home to take Beau on a walk. I didn't realize that Ingram's idea of taking Beau on a walk was not the same thing that I was thinking. He was still in riding mode from last night's trick or treating and decided that he needed to drive his four wheeler instead of actually walking with Beau. soooo exhausted that he needed to stop for a Gatorade break. I think I'm going to really love "Super Ingy Day's!" ...and to pet goats and have Ingram's shirt eaten by "Blackie the Goat!" Nothing and no one could keep these boys from playing tag! Who can blame them either?? There was so much room to run that I think even the adults wanted to play too! Ingram loved holding the bunny rabbit too, but neither of us could figure out the red eyes! They're just weird if you ask us! Ingram even got to climb a rock wall! He's watched the girls do this several times, but I don't think has ever done it himself. The video wouldn't load for some reason, but he made it to the top and rang the bell. Once he was down, he shot a quick "Thumbs Up!" with a smile and then went on to CONQUER the small wall without a rope! After climbing the rock wall, all the kids went outside for a hayride around the property. Ingram and Nolan picked spots right next to each other and gave kisses before they were hauled away on the hayride. They had a blast on it and apparently went to Florida to get ice cream, then went shopping at Target to buy presents, and came back all within about 5 minutes. I never knew a hayride could be so adventureous! Of course all that adventuring made them quite hungry so it was off to roast hot dogs and s'mores at the bonfire when they hopped off the wagon. All the adventures of the week made it very easy for Daddy to talk Ingram into "watching a little football" in the bed Sunday afternoon! Afterall, getting an extra hour of sleep with daylight savings time doesn't really help when Ingram tried to stay up with the girls at their sleepover till after 10pm and then woke up around 6am. I sure am glad it was a football afternoon at our house; actually, it was a footbal night too because Daddy and Ingram were outside in pajamas throwing the football before bed. After playing football with Daddy outisde, they watched a little more football inside then off to bed!